FOB destination stands for “Free on Board Destination”. FOB is one of the commonly used shipping terms which means that the legal title to the goods remains with the supplier until the goods reach the buyer location. The FOB destination is the location where the ownership changes hand from the seller to the buyer and thus the actual sale of goods occurs. This is important for the accounts, as it dictates the period when the amounts need to be entered in the records. The FOB destination outlines the key terms indicating whether the seller or buyer will incur the expense to get the goods to the destination. With goods at FOB destination, the title to the goods usually passes from the supplier to the buyer. This means that goods are reported as inventory by the seller when they are in transit since technically the sale does not occur until the goods reach the destination. 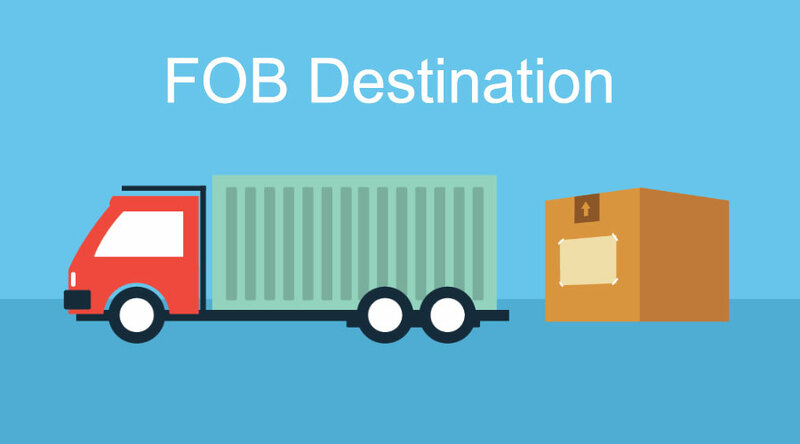 FOB destination shipping point is the alternative terms for recording the sale in the records which indicates that the sale is recorded when the seller ships the goods. The point of FOB destination shipping is to transfer the title of the goods to the buyer from a seller as soon as goods have arrived at the buyer’s location. In accounting, only when goods have arrived at the shipping destination, they should be reported and as a sale and an increase in accounts receivable by the seller and as a purchase and inventory by the buyer. When a sale is made, a company must record sale for the merchandiser and manufacturer. The term FOB destination shipping tells that the sale will officially occur when it arrives at the buyer’s receiving dock. The buyer will record an increase in its inventory at the same time as the buyer is undertaking the rewards of ownership and the associated risks, which occurs at the point of arrival at its shipping dock. The FOB Destination shipping term applies also to the cost of shipping and the responsibility for the goods which means that the supplier is the responsible party for the goods and must undertake the delivery fee and the cost of any damages. Freight prepaid and allowed: In this case, seller bears and pays the freight charges and is the owner of the goods while they are in transit. Transfer of title takes place only when the goods reach the buyer’s location. Freight prepaid and added: In this case, freight charges are paid by the seller but the same is billed to the customer. The seller owns the goods in the case also while they are in transit. Transfer of title takes place only when the goods reach the buyer’s location. Freight collect: In this case, the buyer pays the freight charges at the time of receipt but the supplier still is the one who owns the goods while they are in transit. Freight collect and allowed: In this case, the buyer pays for the freight costs but deducts the same from the final supplier’s invoice. The seller still owns the goods while they are in transit. Any type of FOB terms will be superseded if a buyer elects to override those terms with a customer-arranged pickup, where a buyer arranges to have goods picked up at its own risk from the seller’s location, and takes responsibility for the goods from that point. In this situation, the billing staff is required to be aware of the new delivery terms so that it does not bill freight charges to the buyer. If the goods are damaged during transit, the seller should file an insurance claim with the insurance carrier as the seller possess the title to the goods during the period when the goods were damaged. In most cases without FOB agreement, the shipper/seller will probably record a sale as soon as goods leave its shipping dock, irrespective of the terms of delivery. Thus, the real impact of FOB destination shipping terms is the determination of who bears the risk during transit and pays for the freight expense. Bloemen Alle is a Russian businessman engaged in export of carpets. It received an order worth $5,000 from a Dubai based customer on 10 October 2013 and the supplier was asked to ship the carpets by 25 October 2012 under the FOB agreement. Bloemen Alle shipped the flowers on 21 October 2012. The shipment cost is $400. When should Bloemen Alle record the sale? When should the Dubai based customer record the sale and at what cost? Since the shipment is FOB shipping point, the delivery is made at the moment the carpets are shipped. Bloemen Alle should record the sale of $5,000 on 21 October 2012. The Dubai based customer should record the purchase on 21 October 2012 too. It should record the inventory of $5,400 ($5,000 purchase price plus $400 shipment cost). It is because, under a FOB destination shipping point, shipment cost is normally incurred by the buyer. XYZ’s corporation orders 100 computers from Dell to replace its current point of sale systems. XYZ orders them with FOB destination shipping terms. After receiving the order, Dell packages up the computers and sends the packed computers to the delivery department where they are loaded onto a ship. Halfway to its destination, the ship crashes and the computers got destroyed. Who is responsible? Since the computers were shipped, Dell (the seller) is responsible for the damage during the shipping process. The goods were never delivered to XYZ, so Dell, in this case, is fully responsible for the computer damages and would have to file a claim with its insurance company.